But in truth, beautiful days are scarce in Ballingrud’s world. North American Lake Monsters is a small collection of his short fiction but a volume which packs a deceptively large punch for its size. Ostensibly horror stories, these hover at the fringes of the genre and eschew the typical gore and ghosts for something altogether more unsettling. Well okay, maybe some of them veer towards the more conventional horror narratives. Wild Acre for example opens with three construction worker buddies enjoying a moonlight beer together. Their task of protecting the latest project from vandals has turned into more of a big boys camping trip. At least until the boss returns from answering a call of nature to find his friends sprayed across the interior of the half-finished house, some kind of wolf-like creature muzzle-deep in their guts. So far, so werewolf, but rather than follow this into hackneyed hunting/vengeance territory Ballingrud instead documents the mental decline of this struggling foreman. Following the attack his health, career and relationship all fall to pieces around him until there’s nothing but a husk left, in its own way far more terrifying than the initial carnage. The rest of the tales take similarly skewed angles on what initially seem to be more traditional premises. There’s a wonderfully vicious vampire story in here, a stark warning not to be too greedy and never to trust strangers. The Way Station is a ghost story of sorts, a beautifully crafted tale of a man who lost everything he had to Hurricane Katrina and is now haunted by the ghost of New Orleans. Sometimes Ballingrud’s tales almost lull you into a false sense of security as with You Go Where It Takes You, an almost normal take on two lost souls meeting by chance, the sense of unease simmering away unnoticed in the background before the bubble finally bursts and everything falls apart. Perhaps creepiest in my mind was The Good Husband, the only previously unpublished tale to be included here. It tackles the issue of depression and suicide in the most unnerving manner, raising the curtain to a scene of a husband witnessing the aftermath of his wife’s most recent and final suicide attempt. Suddenly reconciling himself to her mental state he divests himself of the urge to call for help and simply leaves her to find peace. The last thing he expects is to wake up to find her beside him in bed. What follows is so grim and bleak that it was simultaneously a struggle to continue but impossible to stop reading. 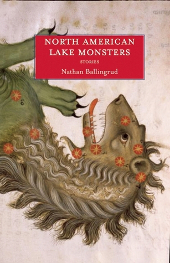 North American Lake Monsters succeeds largely on account of Ballingrud’s unique narrative style, twisting stories every which way and transforming the grotesque into the mundane and vice versa. His New Orleans background is dripping off every page and lends his work a gothic feel with a claustrophobic, sweltering atmosphere. It’s a quick read but one which will leave you wanting much more. Buy North American Lake Monsters from Small Beer Press here.